The only diploma hanging on the wall in Barry Bozeman’s office is from Palm Beach Junior College. “My goal was to be a baseball player and the better teams tended to be at community colleges,” he said. Bozeman attended the college on a baseball scholarship. Bozeman was the first in his family to go to college. 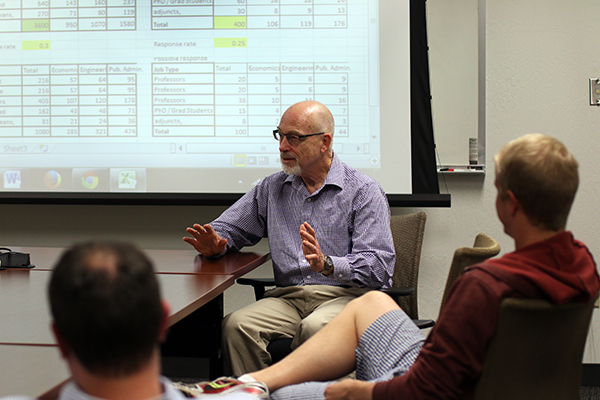 Today, he is one of the nation’s leading scholars in public administration and the Arizona Centennial Professor of Technology Policy and Public Management in the School of Public Affairs, part of the College of Public Service and Community Solutions. He went on to attend Florida Atlantic University, where he decided to get more serious about school and made his way from being an average student to a 4.0 academic. “When I got my undergraduate degree, my parents were so proud I thought they were going to burst,” he said. Then he told them he was going to graduate school in political science. These types of disconnects are not only experienced by first-generation students, but also part of a larger interaction among race, class and gender, Bozeman says. Bozeman has always been interested in students who don’t come from families with a large amount of social capital or any post-graduate education. “They do run into issues that professors don’t normally think about – such as having families that have never even heard about graduate degrees in social sciences or maybe don’t understand why someone would want to delay getting married or getting a job,” he said. “If you know what you want to achieve, don’t compromise. What often happens is that people have a real passion for something but think ‘I don’t have a chance to do this,’” he said. Bozeman’s own path led him to public administration – primarily studying organizations and why they do or do not work. “I was attracted to thinking about organizations not just in terms of how we instrument and manage them, but thinking about them theoretically as populations of organizations that have characteristics and how they relate to one another,” he said. Bozeman says that publicness is not about government, business or nonprofit, but the extent to which political authority influences an organization and how behavior is governed by either public or market mechanisms. Bozeman’s Center for Organization Research and Design at ASU looks at increasingly complex organizational structures, particularly technology- and knowledge-based entities that do not fit the traditional model of public or private. Their work is focused on the various dimensions of publicness – such as personnel decisions, budget, structure – and how to measure them and the implications for outcomes. His work has practical application for students contemplating a career route.